3 Bedroom Flat For Sale in East Sussex for Guide Price £1,100,000. WATERSIDE - An opportunity to acquire a stunning third-floor apartment in a landmark position with views towards the sea. The property extends over two striking Grade II-listed buildings on Adelaide Crescent, enjoying views across the central green spaces opposite and down to the seafront. The property is full of character and first impressions are of an excellent sense of space, with many of the rooms benefitting from character features such as ornate coving, picture rails, ornamental arches and period fireplaces. Inside great care has been taken to modernise the interiors, with a neutral style throughout enhanced by modern additions such as a monochrome tiled floor in the kitchen and bathrooms and a striking black gloss kitchen. The sitting room is of a good size and leads through to a study via two open archways, offering further scope to expand the living space across two rooms if required. The living space also includes a spacious kitchen/dining room, which has a good selection of base units complemented by solid wood worktops, as well as integrated appliances such as a gas hob, dishwasher and oven. There is further space for freestanding appliances in the utility room. The three bedrooms all feature period features, with bedrooms one and two being particularly roomy and sharing use of a jack and jill shower room, with bedroom two also having its own private wc. In addition, there is a separate shower room off the main living space. 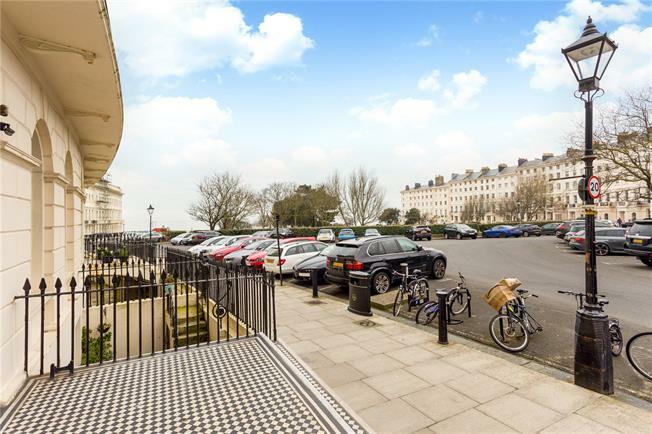 In a stunning location with views towards Hove Lawns and the sea, the apartment is situated in a prestigious residential road of grand period properties in a highly sought-after area close to the seafront. There are attractive green spaces in the centre of the crescent and within close proximity is Hove Lawns, ideal for walks along the promenade. Western Road is nearby with an array of boutique shops, trendy cafe´s, bars and restaurants. Central Brighton is easily accessible by local buses to reach the more extensive high street shopping area and Churchill Square. Hove Station is 1 mile away and Brighton Station is 1.3 miles with fast and direct trains to London and Gatwick Airport. The seller informs us that the service and maintenance charges (including buildings insurance and ground rent) amount to approximately £1,360 Bi-annually. Approximate uxexpired Term of Lease: 997 years Lease due: 3016.